Build up may be due to dryer configuration, use of wider spray angles and powder formulation, but in many cases it’s the nozzle design. Product build-up drips on the chamber and becomes scorched particle deposits that compromise powder quality. Click&Dry™ flat cap design provides a lower outer face profile greatly reducing build up. 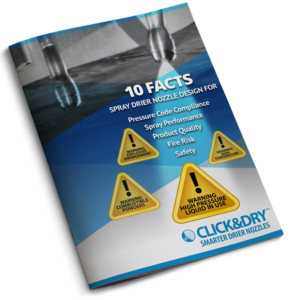 Studies performed in New Zealand show that chambers using Click&Dry™ technology produce powders with 20% less build up than any other spray dry nozzle. This is achieved by moving the o-rings into the disc orifice. Traditional nozzle designs have misalignments between swirl chamber and orifice. Decentralised parts create inconsistent spray performance and affects the powder quality through all drying operations. Bearding may be due to dryer configuration, use of wider spray angles and powder formulation, but mostly due to deficient nozzle design. This increases the cleaning up frequency, which delays production. Stopping production for cleaning and short run times play a big part to dryers’ low productivity. Click&Dry™ flat cap design provides a lower outer face profile greatly reducing bearding. This means less dryers shut down for clean up, and therefore, higher productivity. If we reduce build up, we slow bearding process and therefore, nozzles can run longer. Click&Dry™ system offers longer run times! By moving the o-rings into the wear part helps achieving this result. Cleaning traditional spray nozzles is difficult due to o-ring groove inside the cap. Conventional cap chamber design have tight and out-of-reach corners that harbour unreachable contaminants. Click&Dry™ caps are designed to be easy to clean and produce higher hygienic results. With smooth internal profile, the spray dry industry can now reach the new level of hygiene with increased ease. Click&Dry™ Smooth bore design improves cleaning and hygiene. Disassembling baked nozzles could be challenging. Using impact tools such as hammers leads to high breakage and wear part costs. Click&Dry™ disassembly procedure doesn’t require impact tools to hit wear parts. This minimises breakages and reduces operating costs. Ordinary thread systems are too fine to resist normal impact damage. Additionally, unprotected sealing faces can be easily damaged during handling, resulting in cutting and re-welding nozzle bodies. 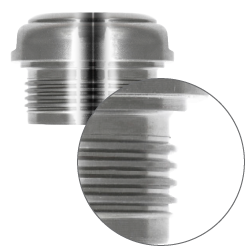 Click&Dry™ nozzles were designed with heavy duty threads with a special form which is highly resistant to normal impact damage during lance handling. Click&Dry™ nozzles also come with a seal face protection skirt. This robust cap protection skirt is designed for protection against o-ring seal groove damage. Conventional radial seal systems can suffer from o-ring drag and tearing during assembly, compromising critical sealing. 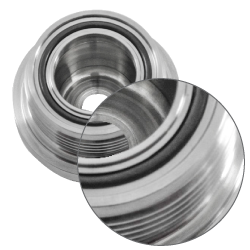 Click&Dry™ Axial o-ring design can only reach sealing face when the cap is fully engaged to body. No dragging and tearing during assembly means less risks of leakage.